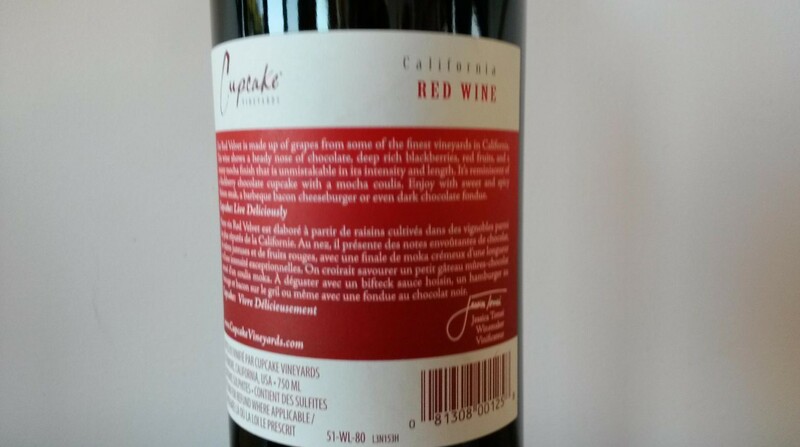 Would you buy a bottle of wine you’ve never tried before that has the word “Cupcake” on the label? Red Velvet’s descriptive wine label by Cupcake Vineyards. Yumm . . . My tastebuds are going wild already, and I haven’t opened the bottle yet. I’ll be drinking it tomorrow night with my g/f and a friend, and I am hoping it lives up to what the label promises. Indeed, when we buy particular wines for the first time, we often have little to go on, unless we have read a review by a wine critic. We pretty much have to rely on the label’s description. Of the vineyards that do take the time to describe the flavours you will taste when you drink their products, I am finding the descriptions to be pretty accurate. For example, Revolution Red is described as having bold flavours, and indeed, they are bold. It’s one of my fave California wines, right behind Barefoot Shiraz in my top 10. So, I have high hopes for Cupcake’s Red Velvet. It cost almost $16 at the SAQ (a provincial government-sponsored liquor commission outlet), which is almost $5 more than the Barefoot. But I have also learned that higher prices don’t always mean a better product. My g/f brought over a bottle of French wine recently that cost her in the mid-$20 range, and it was awful — like a weak cherry drink. And the winemaker didn’t provide a description of it on the bottle . . .
How about you? Do you find that wines generally live up to their taste descriptions on the labels? I was never able to acquire a taste for beer. I always found it bitter. But the local supermarket, Metro, has a lot of specialty beers that — on the labels — look interesting. As for the Robin Williams vineyard estate, it does look like a lovely property. At $30 million, I’m surprised it didn’t sell quickly. Let’s see now: if you and I buy it as a joint venture, it would only cost us $15 million apiece. Are you in? We still have some mead left. 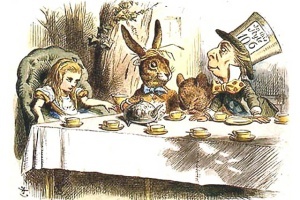 It’s nice, though — a real treat. As for beer, naw, it won’t happen for me. Too many good wines to try, anyway. Key points: wine comes in red and white, you like it or you don’t. My wife and I had a day touring and tasting in Napa Valley back in 1996. They were all good but the best were from the smaller vineyards. The wine we liked best (and brought a bottle home to to have with Christmas dinner) was from the Robert Sinsky Vineyard. That was a “claret” style red which was a blend of grape types. The best white was a chardonnay from Cuvaison Estate Wines. We also get treated to some Santa Cruz Mountains vineyard wines by my brother-in-law and his wife that live in the vicinity: Bonny Doon Vineyard and Bargetto Winery. As for wine labels: Even when they have descriptions on them I often can’t match what I taste to what they describe. A red I have enjoyed recently is South African rather than Californian: An organic red from a winery called Org de Rac. I got in a 3l box from Systembolaget in Malmo that is 65% Shiraz, 25% Cabernet Sauvignon, 10% Merlot. (Availabe in bottles, too.) You might find that in Ottawa. Thanks for the tips, Marcus. I will look for those wines here!